Well, I don’t know if you have noticed – middle of Lent and I have not spent a lot of sermon time talking about sin, so far. But that changes today because our Gospel lesson for Lent IV is, in part, about sin. What exactly is sin? What does it do to us and how do we deal with it? These are some of the questions posed by this text. So, what do you think about when you hear the word sin? I suppose you think about doing bad things – breaking the 10 commandments or doing hurtful things to others. Perhaps you think of sin in terms of rewards and punishment. If you are good – God will reward you; if you are sinful you will be punished. This is a very popular way of looking at sin; in part I suppose because it makes logical sense to us. That seems to be the way the world works, right? Many years ago – when I was in high school I spent my summers, as I think I have mentioned before, working out in the warehouses and in the yard at a lumber company. My supervisor was an older man named Johnny. Johnny was very religious, and at the time I was filled with questions so we spent a lot of time talking about Christian faith. I remember one conversation very vividly. We were talking about sin and Johnny spelled out the rewards/punishment view and told me that that was how it was – that is how God acts: God rewards the good and punishes the sinners. As an example – he told me about a young man he knew who was a Christian, but who had fallen into a wild life of partying and then one night after a little too much to drink and a little to much speeding he had an accident and he was killed. That, said Johnny, proves my point. God caused that accident – that was the punishment for his lifestyle. Wow, is that true? Does God zap us like that? Are the earthquakes in places like Haiti and Japan God’s retribution for things that may have happened centuries ago – as has been claimed by a certain well-known TV preacher? Is this the way God acts? And if so – well, where is Grace? Dealing with sin on the basis of rewards and punishments was as popular an approach in the time of Jesus as it is in our day. At the very beginning of our Gospel text Jesus and his disciples are walking through a town and they see a blind man begging. 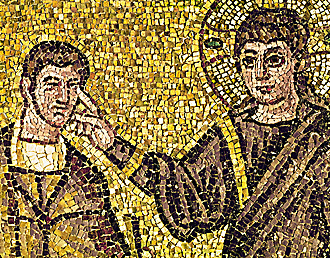 “Look at that man,” says one of the disciples, “he has been blind since birth. Is he blind because of his own sin or his parent’s sin?” Notice there is no other option for this questioner – it is assumed it is one or the other. There is no 3rd option here. But Jesus rejects this reward and punishment approach to sin out of hand – “Neither his sin nor his parents” says Jesus. That is not how God acts. God doesn’t make people blind as a form of punishment; God doesn’t hold grudges for centuries and then visit devastation in the form of natural disasters on places like Haiti as punishment; God did not “take,” (to use Johnny’s word) God did not “take” that young man – the accident was the result of his own bad choices. In that case, there is a difference between punishment and consequence. So, what does Jesus say and do about all of this? “Through this man’s blindness the glory of God will be revealed.” And then Jesus proceeds to bring sight to the blind man; Jesus proceeds to bring light into the midst of deep darkness. That is how God acts! Through Jesus, the light of God’s love and grace illumine even the darkness of sin, and loss and death. Look, we live in a fallen world – we sometimes make bad decisions for which there are consequences – others sometimes make selfish and self-centered decisions that hurt us – sometimes natural disasters befall us. The promise is that God’s love and grace will permeate these situations – God is present with us in the midst of them – “nothing can separate us from the love of God in Christ Jesus,” says Paul. And God brings life from death – joy from sorrow – order out of chaos - light out of darkness. This is what Jesus means when he says that through this situation the Glory of God will be revealed. The Glory of God is shown in Jesus – who was crucified and then on the 3rd day rose again. In other words, God brings resurrection from death. That is the point. Death and darkness and loss and fear and grief and violence and unemployment and on and on – they are a real part of our fallen world, with which we must contend and by which we are affected – but they do not have the last word. The last word is resurrection and love and grace, which is shown forth in Jesus Christ our Lord. Now, I began this sermon with a series of questions about sin – specifically the question of what exactly is sin, according to this story and the Gospel of John. As I noted earlier, we tend to define sin very narrowly as bad things we do or as breaking the 10 commandments and so on. But John has a different approach to the question of sin. For John our usual way of defining sin is off the mark – doing bad things or not following the 10 commandments should be seen as symptoms of sin rather than as sin itself. For John the definition of sin boils down to one thing: belief. Do you believe? Or not? If you believe then you like the Blind man can see and like the Samaritan Woman you are in the light and are walking with God. If you do not believe then like the Pharisees in this story you are really blind and like Nicodemus you are in darkness – you are in sin. Belief therefore frees us from sin – it frees us to follow, it frees us to love and it frees us to action. The best example of this is Luther who, as a young Augustinian monk, spent hours and hours in the confessional confessing every little sin he could possibly think of. And just when he thought he had finished he thought of more. He could not be free of these sins – they were constantly weighing him down and they paralyzed him. His exhausted confessor, Johann Staupitz pointed out to Luther that at the core he had a problem with trust. He needed to trust – he needed to believe that God loved him; that God surrounded him with grace and that Jesus died for him. This is what John is saying to us – do you believe? Do you believe that Jesus died for you; that Jesus’ resurrection is for you? Do you believe that you are loved and forgiven by God and that God’s grace permeates every dimension of your life? Yes, Lord, I believe – says the Samaritan Woman and the Blind Man and Mary at the grave of Lazarus. Can we affirm those words with them? Does this mean that everything will be perfect from now on – no? Does this mean that there won’t be consequences for bad decision – or that there still won’t be loss or natural disasters – no. What it means is that there is hope and that from the darkness of loss and death we know and can affirm that the resurrection of Jesus is the last word; that God’s grace is the last word. I once was lost but now am found – was blind but now I see. "Amazing Grace" Sung by Celtic Women with a very cool Bagpipe band!